(RNS) The American Civil Liberties Union collected more than $11 million and 150,000 new members. The Southern Poverty Law Center’s Twitter account gained 9,000 followers. And the Anti-Defamation League, which fights anti-Semitism and other bigotries, saw donations increase fiftyfold. In the days since Donald Trump won the presidency, these spikes in support for groups that defend religious and other minorities speak to a fear that the president-elect will trample on their rights — or at least empower those who would. Picked retired Lt. Gen. Michael T. Flynn, who has described Islam as “a cancer,” as his national security adviser. Appointed Stephen Bannon, who ran a presidential campaign criticized for playing to angry voters’ Islamophobia and trafficking in anti-Semitic imagery and tropes, as his most senior adviser. Chose a top transition team official who says he is ready to create a registry of immigrants from nations where terrorist groups flourish, a list — critics say — that will target Muslims. “At this point we are going to take him at his word,” said the ACLU‘s Daniel Mach on the likelihood that Trump would make good on his call for a ban on Muslims entering the country, increased surveillance of mosques and the “extreme vetting” of Muslim immigrants and visitors to the U.S.
“Even if these policies ultimately get overturned, they can still do damage in the short term,” Mach said. “There would be robust legal challenges to these kinds of measures,” Patel said. Patel noted that both George W. Bush and Barack Obama took pains to distinguish between Islam and violent groups that claim to act in the name of Islam. She fears that “careful work” could unravel under the president-elect. Jewish groups and politicians, including the ADL, have charged that Trump campaign ads and social media stoke anti-Semitic flames, employing age-old language and symbols used by conspiracy theorists to paint Jews as agents of economic ruin. 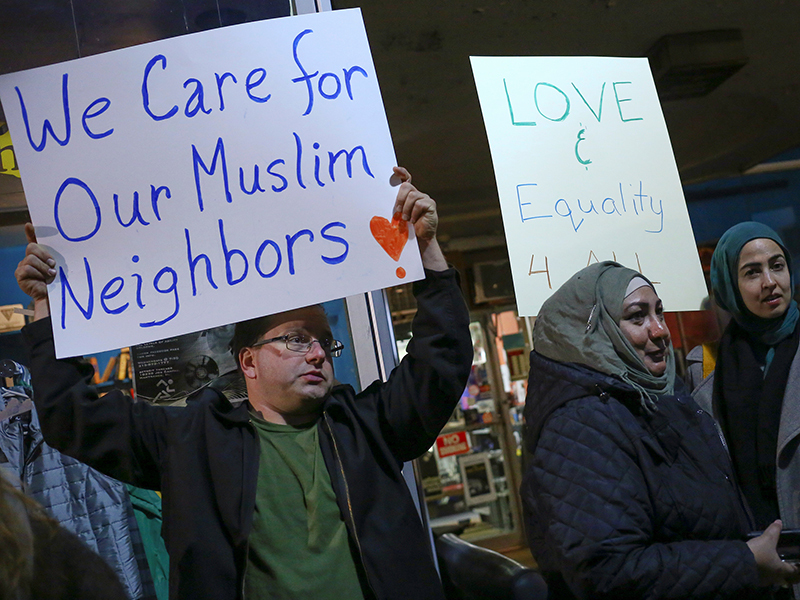 At the conservative Cato Institute, senior fellow Jim Harper, a legal scholar who studies counterterrorism among other issues, worries that a Trump administration poses a real threat to minority religious rights. But he also points to several countervailing forces that may mean the worst of those threats will not be realized. But before the courts may be called upon to overturn Trump edicts, Harper continued, he would face other impediments. Patel said one more obstacle stands in the way of a Trump administration running roughshod over Muslims’ and others rights: a robust network of civic organizations that has grown in the past 15 years to uphold doctrines of equality. The president-elect is man of practical mien, and will certainly not be omnipotent in office; there are Constitutional checks and balances, most likely a centrist Congress, and an independent judiciary, apart from that, despite fears of a growing intemperance on the part of the American people, I think that fear is unfounded. To the degree that intemperance exists, there are culpable parties on both the Left and the Right. You do realize this Bannon antisemitic info is made up out of thin air, right? Go to Briebart and see how many articles are written about the Jewish people and state. Andrew was Jewish and I do not think he would have left his beloved site to someone that did not support his views. I am pretty sure spreading false rumors is a sin in most faiths. If Trump harrasses these groups then shame on him. But it is fascinating how uninterested you seem to be in the groups who have experienced discrimination from the Obama administration. Ask the Little Sisters of the Poor about harrassment. Or all the pro-life Christian colleges. Or the Christian institutions with a traditional sexual morality in place. Or the students at the University of California law school who got kicked off campus. Or the conservative groups who were targeted by Lois “Fifth Amendment” Lerner and denied tax exempt status. I talked to the vice president of a Christian university a few days ago. She is no fan of Trump but she said his election, “saved our university.” I don’t want any minority religious groups targeted by our government. But how about a little concern for the ones who actually are being molested as well as those who might be. That’s not discrimination, it’s a popular right wing meme. That’s abiding by the constitution. Those groups are free to practice their religion. They are not free to force anyone else to. I disagree Edward. The KKKNazis, aka White Supremacists, aka Alt-Right, are an integral part of the pres-elect’s transition team and incoming administration. While there are checks on the president, such presences in the White House are already shown to be highly encouraging to the hate groups and individuals who are very racist/ misogynist/anti-semitic, etc. The danger is not only what the new administration will do, but what it won’t do. Reluctant enforcement of constitutional guarantees is a real possibility. There is no Leftwing group of dangerous haters, nor encouragement of violence against Americans. That’s not to say there isn’t violence on the Left, but it’s very small potatoes compared to the white supremacists, now more benignly and inaccurately referred to as the alt right. Oh grow up. Wipe the spittle off your mouth which developed in anticipation of being a victim. Obama stole the 2012 election by using the power of the government to stifle dissent – but, of course, the liberal press, like this writer, gleefully looked the other way. How’s that for real oppression? You and all leftists are more concerned with Christians praying than you are with Islamists cutting off heads. No violence on the left?? What’s that, a joke? Try reading the news – have you seen what the anti-Trump “protesters” are doing? Have you heard of the Trump supporters being beaten? Time to get back on your meds. Did you even read my post? You are the one making me dispense birth control. You are the one making me dispense abortifacients. You are the one making me celebrate a gay wedding. You are the one trying to change my school’s conduct code. You are the one forcing your religion on me through the power of the state. For the life of me I can’t understand why the Left does know it is the new state religion and forcing its beliefs on everyone else. I’m concerned with both. I don’t think one excludes the other. I’m not making you do anything. Are you a pharmacist? baker? What is happening is that you don’t get to discriminate like you have in the previous 200+ years of the USA. I urge you to never use birth control if it offends you, never celebrate any wedding you don’t like, never have an abortion. Ever. And you have no say if another chooses to do any those things. None. Zero. For the life of me I can’t understand why the Right doesn’t understand the Constitution and the concept of equal rights for every single person. Not only is Islam not allowed to enforce Sharia Law on the population, the Right is not allowed to enforce Christianist Law on the population. Anyone can observe the vitriol flaming out of the mouths of the rabble-rousers whose only goal is to undermine the U.S. Government and cause anarchy in a nation they feel should be a socialist-Marxist style government. Trump’s victory has dumped burning coals on their heads and their hate has deranged them. Following the letter of the Constitution is the only sure way of keeping America a paragon of freedom and maintaining personal rights. It’s really incredible that they ignore what happened on 9-11! To them it’s like it never happened! ~~~~~ Only fools “tar everyone with the same brush.” If you are so sure that MOST churches practice “segregation”, you had better be able to make a list of those churches that comprise the majority and then prove that they “segregate”. If you cannot, then you ARE one those fools! YOU WROTE: “Those groups are free to practice their RELIGION. As things go, Islam is NOT a true religion that can be ascertained by the institutional definition of a “religion”. Neither is Islam a cult. In its fullest form, it is a complete, total, 100% system of life with the psuedo- theocratic sociopolitical belief system that, through edits of the Qur’an and proclamations by its Imam leaders, advocates and sanctions physical aggression, deception, and subterfuge to achieve its stated goal of a worldwide Caliphate. Islam has legal, political, economic, social, and military components. The “religious” component is a COVER-UP for all of the other components. They conventionally practice genocide focusing on Al-Kafirun (infidels), honor killings, female suppression and mutilation, demonic brutality, vandalism, and sweeping hate. How many “religions” of the world hold to those tenets? Islam is not interested in peace. Islam is not interested in tolerance. Islam is not interested in coexistence. It wants only to subjugate or eliminate ALL competing belief systems. These are not my words. These are the stated goals of the Qur’an and its Imams. Read the Qur’an. Google the proclamations of its Imams. They seek to take advantage of the West’s religious tolerance. Crushing the ideology of Muslim supremacism and ridding the world of these death worshippers would be the greatest act of love we could do for the entire planet — especially for those in the Arab world who do desire peace and do not hold to the tenets of Islamic hate, violence, and Shari law. Liberals will never concede that they, in fact, are the ones “forcing” their Humanism on others. I have found that in a dispute with the left on this topic is much like discussing the nature of daylight without mentioning the sun. They are masters of the double standard. We are mankind. We are the past and the future. Do not despair – life is happening as it should. Our limited minds and our narrow judgments perceive only chaos and doom when we cannot control what we desire, but God has no limitations on his control and wisdom in dealing with what happens on this earth. In other words, God isn’t making up a plan as he goes along. Nor did He wind up the clock and walk away. “The Most High God rules the kingdom of man- kind and sets over it whom He will” (Dan. 5:21). He “executes judgment, putting down one and lifting up another” (Ps. 75:7). “The LORD will not turn back until He has executed and accomplished the intentions of His mind” (Jer. 30:24). Living in your paranoia must be very exhausting !! Bible verses can easily be found to make the very same case about Christianity and you are fully aware of that. However, it seems every religion is skilled at cherry picking words from their own sacred text to make it look good, while using the same skill to the opposite result for a religion they see as competition. The same is true when denominations within the same religion attack one another. No, Islam is bound inherently violent and dangerous. Neither is Christianity, but in the wrong hands, either can be.